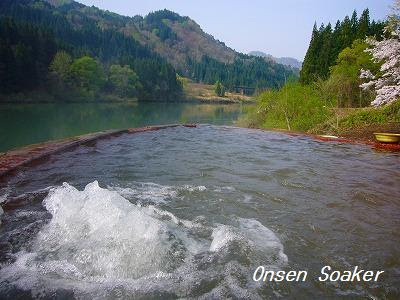 onsen soaker: Term Limited Rotenburo, Oshio Onsen, Fukushima Pref. Term Limited Rotenburo, Oshio Onsen, Fukushima Pref. Some say "miracle", others say "legend". 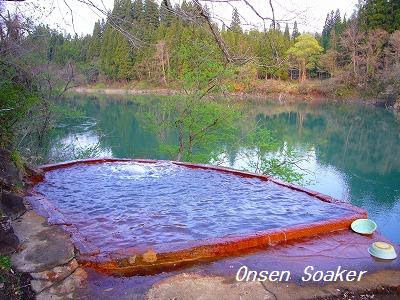 I think both words aren't exaggerating at all to describe this Oshio kikan-gentei rotenburo（大塩期間限定露天風呂）, or the term limited open-air bath of Oshio Onsen, and I say it's a "mystery of nature". This rotenburo dried up long ago and being empty most of the year. But on a spring day of several years ago, the hot spring suddenly revived, and after a few weeks it stopped and dried up again. Since then it's available for soaking every spring for 6 weeks at most. Nobody but mother earth knows when the hot spring starts spouting and how long it lasts. I heard it tends to start spouting later after snowy winter. It was available from mid March to early May in 2007 after less snow than usual winter, and from April 17 through May in 2008. But the relationship between snow and the hot spring isn't clear so far. I visited here late April in 2008. 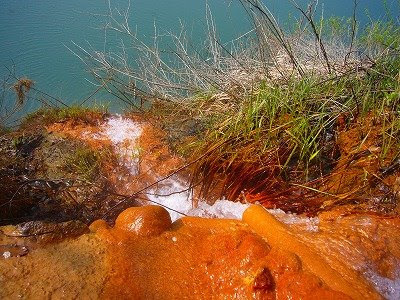 The hot spring was spouting vigorously from a hole at the bottom of the rotenburo. It wasn't so hot, 37-38 degrees Celsius, about 100 degrees Fahrenheit, perfect for long-time soaking. I spent more than an hour in early evening and the following morning each time. A family run inn, Tatsumi-so（たつみ荘） owns this rotenburo. They allow day visitors' soaking for free so far. First you have to ask permission. No wonder staying (paying) guests have priority for soaking. It's a mixed bath, swim suites bathing is prohibited, and there is no changing room. I recommend you to stay overnight at the Tatsumi-so and soak early in the morning or in the night. Hundreds of people visit here on weekends and national holidays. Spring is coming, just around the corner. Get ready! Come see and feel a gift from our mother earth and a mystery of nature. overflowing spring pours into the river. Oshio Onsen is in walking distance from Aizuyokota（会津横田） Railway Station of Tadami-line in Fukushima Pref, Tohoku Region. But visiting here by train isn't practical as Tadami-line train serves only several times a day. Also note four national holidays fall on end of April to early May, making so-called Golden Week, heavy travel season in Japan. In 2009, April 29, May 3-5 are national holidays, and May 6 is a substitute holiday as May 3 falls on Sunday.